Manchester City players did not take too long to stomp their authority in their game as Raheem Sterling opened the floodgates in the 4th minute with a rocket of a shot past Chelsea goalkeeper Kepa. Man in red-hot form, Sergio Aguero doubled City's lead in the 13th minute and after six minutes, he made it 3-0 for the home side. Manchester City struck six goals as Chelsea suffered one of their worst defeats in Premier League since 1991. Pep Guardiola’s men were ruthless and unforgiving at Etihad as they annihilated the Blues in the first half of the match only. Sergio Aguero led the demolition job for his side netting a superb hattrick while Raheen Sterling scored a brace in City’s resounding win. 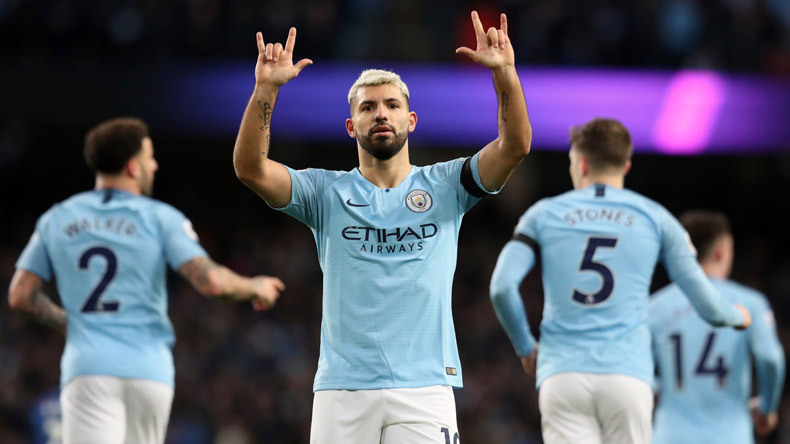 With his second hattrick in last three Premier League matches, Aguero equalled the record of most hattricks in England’s top flight division – 11 – set by legendary Alan Shearer. Manchester City players did not take too long to stomp their authority in their game as Raheem Sterling opened the floodgates in the 4th minute with a rocket of a shot past Chelsea goalkeeper Kepa. Man in red-hot form, Sergio Aguero doubled City’s lead in the 13th minute and after six minutes, he made it 3-0 for the home side. In the 25th minute, Ilkay Gundogan piled more misery on Chelsea and effectively killed their hopes of getting back into the game with a sublime finish. Before the half-time whistle, Maurizio Sarri men were bruised and beaten to the limit with the scoreline reading 4-0. Aguero continued his ruthless finishing in the second half as well as he completed his 15th hattrick in England, equalling the Premier League record set by legendary Alan Shearer, when he converted a penalty in the 56th minute. Also, Raheem Sterling was on a mission of his own as he completed his brace in the 80th minute with a superbly taken goal. Pep Guardiola’s men came close to scoring a couple of more goals but Chelsea was finally spared from humiliation when the referee blew the final whistle with 6-0 written all over the scoreboard. With the rampant win, Manchester City once again usurped Liverpool from the top of the Premier League table. They now sit at the summit with the same point tally as the Reds but with a superior goal difference.